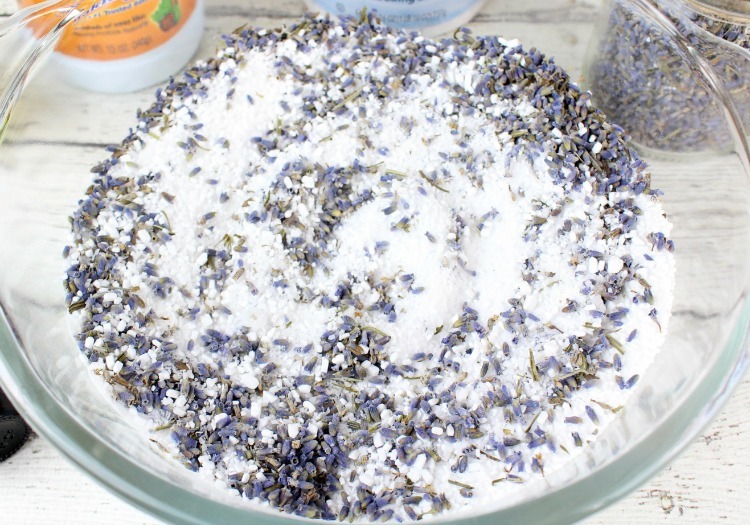 Do you want to relax in a tub of homemade lavender bath salts? 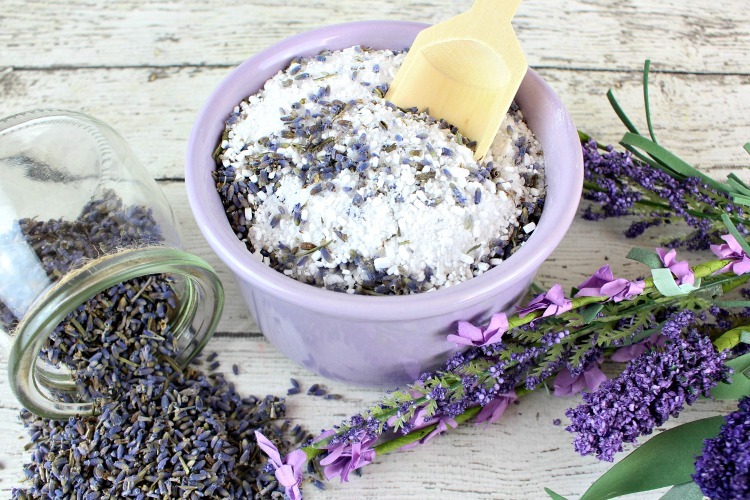 Learn how to make the best DIY lavender bath salts recipe. I have never felt so stressed as I have since becoming a mom. I love my kids so incredibly much that I tend to worry about them all the time! So many moms can relate to that feeling, I know. That’s why it’s so important for us all to indulge in a little me time. Lavender is one of my favorite scents to use when I need some stress relief. I love to use dried lavender, fresh lavender and lavender essential oil – or any combination thereof! Today, I want to add a recipe for Relaxing Lavender Bath Salts to that list. 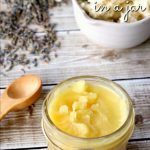 The ingredients will relax your whole body while detoxing through your skin as well. Relaxing in a hot tub filled with lavender bath salts while reading a book is one of my favorite ways to unwind. Give it a try and let me know how you enjoyed it! Add the Epson salt, sea salt, baking soda and lavender buds to a medium mixing bowl and whisk to combine. Drizzle the Vitamin E oil and lavender essential oil on top and stir to distribute the oils. Transfer to an airtight glass container and store up to 6 months in a cool and dry place. Pour 1/4 cup of the lavender bath salts into the stream of bath water to allow the lavender aroma to be released by the steam. Soak for at least 15 minutes. The lavender is calming, relaxing and soothes sore muscles. How often do you get to soak in lavender bath salts? 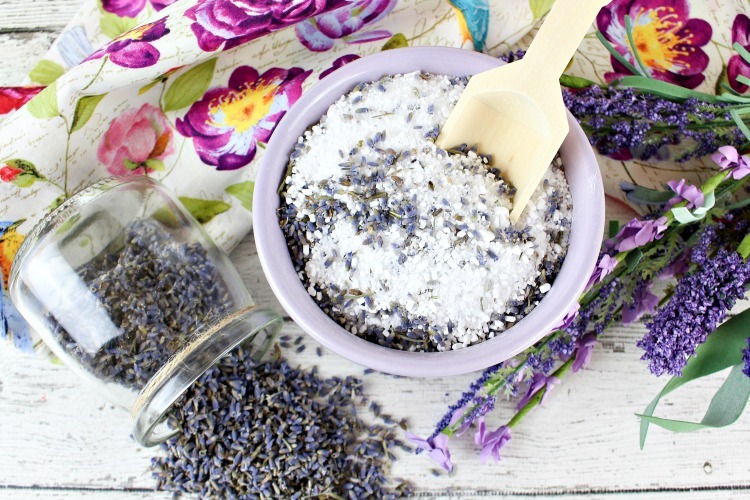 Pin these lavender bath salts to your DIY Beauty board! Just the fragrance alone would be sooooooo relaxing. When my lavender begins to bloom again, I will definitely have to try this. Would love to grow my own lavender even if is only for my own uses. Any ideas how to get started now? Can’t afford to keep having to buy the lavender buds, am on fixed income. Could then make lavender products for daughter and grand daughters also, save us all some green stuff. My first project will be making the lavender bath salts. Great tutorial. Will come back to print out other lavender projects you mentioned. You have me hooked. Grand Junction has it’s own lavender festival but not until July. There are several successful lavender growers/farms in area. I love lavender, and your bath salts are so pretty! I’ll be featuring your post at Best of the Weekend on Friday!